Oxford vs Cambridge – Which Blue Are You? This Sunday, London will see the 160th Boat Race between Oxford and Cambridge Universities. The Boat Race is an annual contest that takes place close to Easter each year on the River Thames, between Putney and Mortlake. The first time the event took place was in 1829 at Henley on Thames as a result of a challenge between old school friends. From the second race (in 1836) this has instead taken place in London. Going into this year’s contest, Cambridge lead the series with 81 victories against Oxford’s 77, with one dead-heat in 1877. Known as the Championship Course, the distance of the race is 4 miles, 374 yards or 6.8 Km long. The teams compete in eight oared rowing boats, with each boat steered by a cox who sits in the stern of the boat. The prestigious race has included some famous faces over the years, including Olympic gold medallist Matthew Pinsent, TV presenter and historian Dan Snow, Facebook co-founders the Winklevoss twins, and actor and comedian Hugh Laurie. 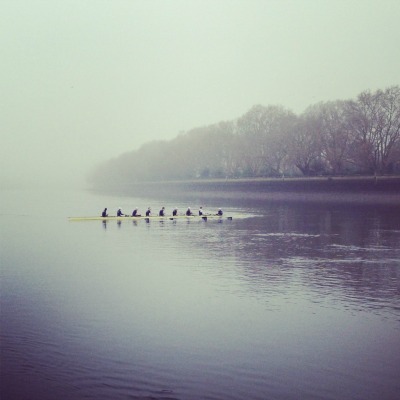 In 2015 the Boat Race will see a significant change as the women’s race will take place on the same day and on the same course as the men’s race. This has not been the case before, with the women’s race usually taking place at Henley on the Sunday before (this year, for example, the race was on the 30th March), however this decision to bring the men’s and women’s events onto the same course with the increased TV coverage is a great reflection on the rise in popularity of women’s rowing and on general equality in the sport. As one of the biggest free sporting events in London and a fantastic tradition, the race attracts thousands of spectators along the banks of the Thames and millions watching on TV from around the world. Boats moored at piers throughout the course of the race offer unbeatable views of the action, however other great places to enjoy the race from include Chiswick Bridge, Bishop’s Park and Furnivall Gardens. 04 Apr	This entry was published on 04/04/2014 at 2:56 pm. It’s filed under Event, River Thames, River Thames Special Events and tagged Cambridge, Oxford, River Thames, River Thames London, rowing, The Boat Race. Bookmark the permalink. Follow any comments here with the RSS feed for this post.